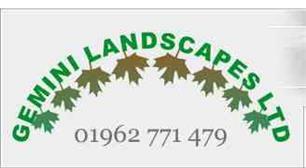 Gemini Landscapes Ltd - Landscaper based in Bishops Waltham, Hampshire. Is your garden all you want it to be – for your family, for entertaining friends, to use, to look at and to admire? Does it need more colour, new sight lines or different landscaping? Would it benefit from the addition of a pond or other water feature? How about a new patio and outdoor accommodation with a wow factor? Or it could be that your needs are more practical – you need better access from one part of your garden to another, tidier organisation, a lower maintenance lawn……. We can point to an extensive and varied portfolio of successful projects and happy clients. We combine mature experience with youthful energy, enabling us to advise on, design and carry out all manner of hard and soft landscaping tasks with speed, accuracy, tidiness and politeness. We have been in operation since 2002, with a trusted team that has gradually expanded with our success. Our guarantee to you is quite simply one of satisfaction. From the moment we receive your phone call to the time of our departure and final courtesy visit, you should expect polite, honest, straightforward dealing. We pride ourselves on making as little impact on your life as possible: the only way you will know that we have been working is in the transformation to your garden. Please email or call us today for a no-obligation discussion of your vision for your garden.